Malwarebytes Premium is an antimalware application that can thoroughly remove even the most advanced malware. It detects and removes malware where even the best known anti-virus and anti-malware applications fail. The program monitors every process and stops malicious processes before they even start. Malwarebytes products have a proven record of protecting computers by completely removing all forms of malware, including viruses, Trojans, spyware, adware and rootkits. The Proactive Protection Module keeps your system safe and secure with advanced heuristic scanning technology. Malwarebytes 3 is the next-gen security program that protects you from the most advanced (zero-day) threats, making antivirus obsolete. Malwarebytes 3 combines all of malware-fighting technology-anti-malware, anti-ransomware, anti-exploit, and malicious website protection into one program. 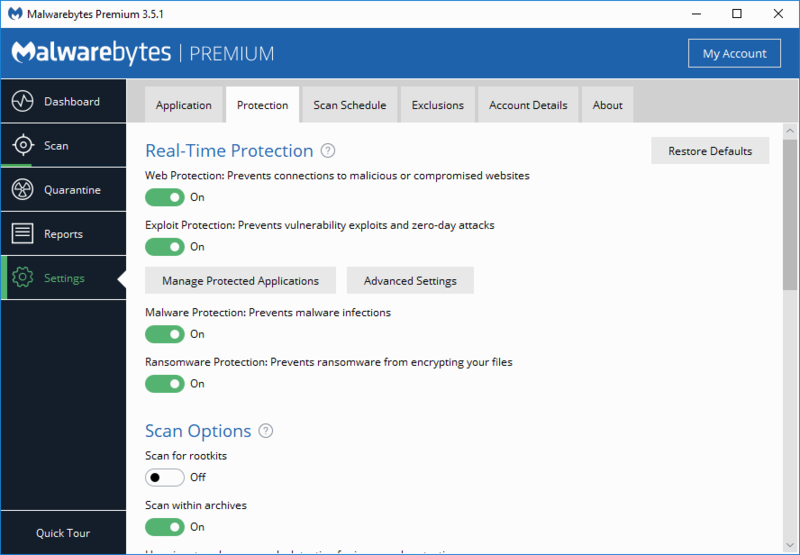 It scans 4x faster than previous versions of Malwarebytes Anti-Malware Premium. The advanced technology protects businesses from the constantly-evolving threat that malware poses to corporate systems. From data loss to network corruption, undetected malware can decrease revenue and wreak havoc on your network. Malwarebytes provides maximum protection while using minimal resources, to keep your system focused on your business. Supported Operating Systems: Windows XP, Vista, Windows 7, 8, 8.1, 10 (32-bit and 64-bit). Languages Available: English, Albanian, Arabic, Bosnian, Bulgarian, Catalan, Chinese Simplified, Chinese Traditional, Croatian, Czech, Danish, Dutch, Estonian, Finnish, French, German, Greek, Hebrew, Hungarian, Italian, Koraen, Latvian, Macedonian, Norwegian, Polish, Portuguese, Romanian, Russian, Serbian, Slovak, Slovenian, Spanish, Swedish, Turkish, Ukrainian. Malwarebytes 3.0.6.1469 CU4 - tell us what means CU4 - cannot find in post. 'Chameleon' tool is found in C:Program Files (x86)ChameleonWindows chameleon.chm. Suspending the activities of the Windows Shell and analyzes the machine for malware. I found malware as 'Riskware.Tool.FCK', 'PUP.Riskware. *' and others, many times, which usually is not detected with the PC in full activity. Sensational this tool, designed to work out of the reach of locks made by malwares or RootKits. Highly positive point for Malwarebites team. I recommend. Self-protection module greatly improved. Now do not more crash by malwares.Good! Hello Guys, You should Try This Strategy: ESET Nod32 6 RC v6.115 + COMODO Firewall v5.10 + MByte's A-M PRO v1.62 + Norton IdentitySafe v6.072 + CCleaner v3.20. & Enjoy the Real Smart Security. Always build your own "Defenses" never trust in ONE Security Suite. Note: =disable Nod HIPS feature cuz Comodo has solid HIPS engine. =enable Malwarebyte's Auto Protect. I hope this version is not as buggy as the last two. Super Anti spyware and EMSIsoft still the best. any way to remove/disable mbamservice.exe from auto start? I'm using free version, and want this app only "on demand".